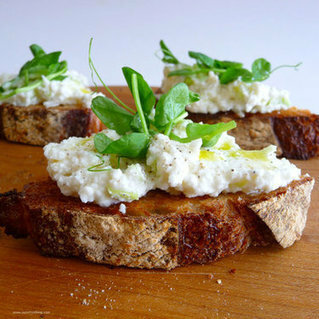 Chopped ramps add crunch, bite and attitude to pristine, fluffy ricotta which is smeared over crostini and topped with a jumble of sweet pea shoots. This simple recipe highlights the freshest ingredients and the contrasting nice and naughty flavors of springtime. If you can't locate ramps in your market, then try substituting spring onions. Preheat oven to 400 F. Lightly brush baguette slices with olive oil. Arrange on baking sheet. Bake in oven until golden brown on both sides, turning once, 12 to 15 minutes. Remove. Combine ricotta, 1 tablespoon oil, 1/2 teaspoons salt and black pepper in a bowl; mix well until light and fluffy. Stir in ramps, mint and lemon zest. Spread ricotta on baguette slices. Top crostini with a generous pinch of pea shoots. Drizzle a little olive oil over crostini, followed by a squeeze of lemon juice. Sprinkle with a few grains of sea salt and black pepper.